Patrick Gallagher was born in Derrintogher, County Mayo Ireland on February 2, 1944. At the age of eighteen, as so many you Irish men and women before him, Patrick immigrated to the United States and the promise of a new life filled with opportunity. He quickly started on the immigrant dream: studying law while working in real estate; even getting involved in local politics as a campaign worker for Senator Robert Kennedy. In 1966, Patrick was drafted for service in Viet Nam. Despite pleas from a heartsick sister living in the states to avoid the horrors of war by simply returning to Ireland, Patrick was committed to his new home in America and instead swore her and other American relatives to secrecy to avoid worrying his family in Ireland. Patrick returned to his native land to visit his family where he told no one that upon his return he would be joining the United States Marines. 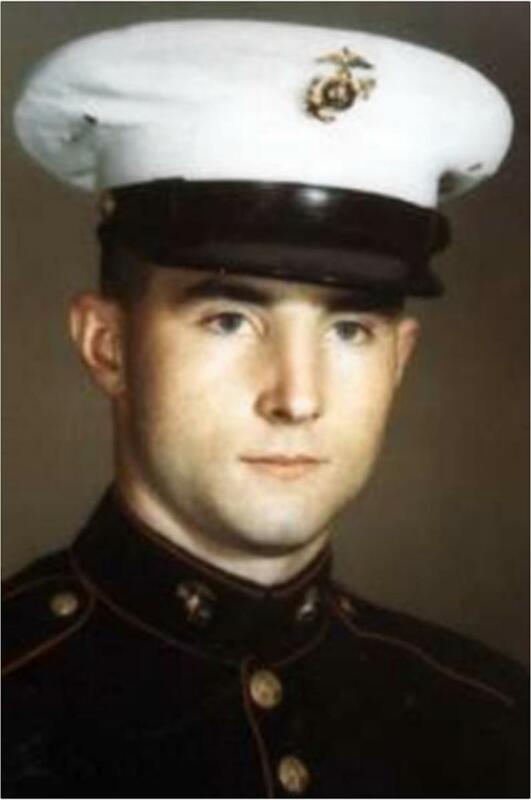 Patrick shipped out to Viet Nam as a member of Hotel Company, 2/4 Marines, 3rd Division. 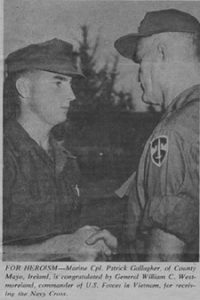 On the night of 18 July 1966, while serving in a forward position at Cam Lo with three other Marines who were sleeping, their position came under grenade attack by enemy forces. The first grenade Patrick was able to kick out of their position where it exploded only to be followed by a second grenade that fell between two of his comrades. Without hesitation and in an unselfish act of valor, Gallagher threw himself on the grenade to personally absorb the full brunt of the explosion and save his comrades. Pinned under Gallagher’s body, the grenade failed to go off. Gallagher continued to lie on the grenade as his three comrades escaped the position despite the fact that two more enemy grenades were thrown into the position to explode around him. His comrades now in a position of safety and still miraculously unhurt, G allagher then rolled off the grenade at his squad leaders order and threw the grenade into the nearby river where it immediately exploded upon hitting the water. Just two months after receiving the Navy Cross and due shortly to return home, Lance Corporal Gallagher was killed while on patrol. 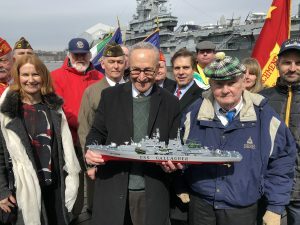 Senator Charles Schumer and members of the Gallagher family celebrating the decision to honor Corporal Patrick Gallager by naming the Navy’s newest destroyer for him. On March 13, 2018, members of the Gallagher family and the Irish American community gathered in the shadow of the historic U.S.S. Intrepid at New York City’s pier 84 where Senator Charles Schumer announced that the Navy’s newest destroyer, DDG-127, would be christened the U.S.S. Gallagher. The U.S.S. Gallagher will not only honor the life and service of Cpl. Gallagher but the 21 other immigrants whose names are inscribed on the Vietnam war memorial who though born in Ireland made the ultimate sacrifice for America; in naming a destroyer for Cpl. Gallagher Senator Schumer and Secretary Spencer have worthily honored them all. The U.S.S. Gallagher will join her sister ships the U.S.S. Barry, named for Wexford immigrant Commodore John Barry who holds commission No. 1 in the United States Navy, and the U.S.S Michael Murphy, named for a descendant of Irish immigrants who was awarded the Medal of Honor posthumously in our Nation’s latest conflict. In every war, in every conflict, Irish American men and women have been stalwart in defense of the America that has offered them so much.